Durch die Kampagne Kuh und Du bin ich wieder einmal auf das Thema Tier- und Umwelt-freundlicher Milchproduktion gestoßen. Zufällig habe ich mir dann auch mal eines der Heftchen “Bio in Berlin und Brandenburg“ im Biomarkt mitgenommen und habe dann dort von verschiedenen regionalen Molkereien gelesen. 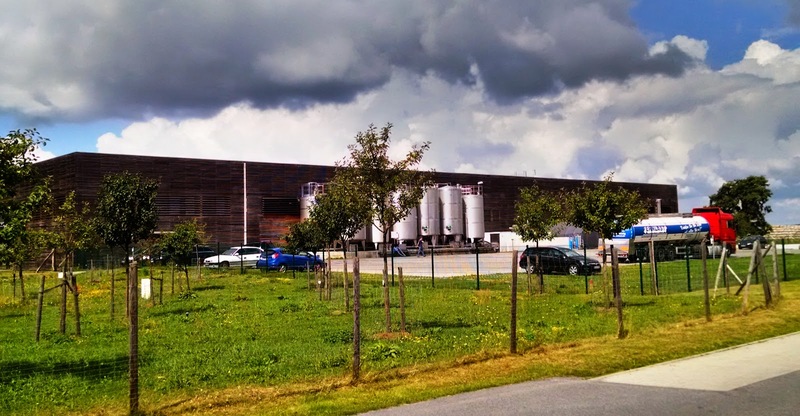 Dazu gehört übrigens nicht nur die gläserne Molkerei in Münchehofe, sondern auch die Hofmolkerei des Ökodorfs Brodowin, sowie die Bio-Molkerei in Lobetal und die Hofmolkerei des Büffelhofs Bobalis. Camembert wird an einem anderen Standort produziert als Schnittkäse, denn der weiße Schimmel des Camembert verträgt sich gar nicht mit der Rotschmiere der festen Käse. Die gläserne Molkerei hat für Camembert den Standort interessanterweise auf der Insel Rügen. Roh-Milch wird bei Bauen durch Molkerei-Fahrzeug abgeholt. Verpackte Milch wird von Groß-Händler (Terra) abgeholt. Beides ist tatsächlich sehr lokal. Nur Käse wird Deutschlandweit vertrieben. Rahm wird immer abgetrennt und für Vollmilch wieder beigemischt. Da auch fettarme Milch verkauft wird, bleibt noch Rahm für Butter-, Quark- und Käseproduktion übrig. Milchpulver wird auf einem fremden Trockenturm produziert, der dafür periodisch gemietet wird. Bio-Milch ist im Laden sogar günstiger als die Milch von bestimmten Marken, die sehr viel Werbung machen. Frischmilch aus Münchehofe wird unter verschiedenen Handelsmarken vertrieben. Die regelmäßigen Salzbäder für die reifenden Käselaiber werden von einem Roboter verabreicht. Leider sind wir so schnell daran vorbei gelaufen, dass ich kein Video gemacht habe. Die Maschinen zur Verarbeitung der Milch (Pasteurisieren, Entrahmen, ...) kommen von spezialisierten Betrieben aus Süddeutschland, Österreich und der Schweiz – eine Gegend, die so sehr darauf spezialisiert ist, dass sie ihre Maschinen in die ganze Welt exportiert. Mir gefällt dieser Kompromiss zwischen Globalisierung und regionaler Produktion: Bei den Maschinen profitieren wir alle von der Spezial-Kompetenz einer Region (und sie werden ja nur einmal transportiert und laufen dann viele Jahre), aber bei den landwirtschaftlichen Produkten bedienen wir uns bei den Schätzen aus unserer eigenen Region. Noch mehr Infos in den Beschreibungen meiner Fotos vom Ausflug. Drinking milk and eating cheese – is it natural, is it healthy, is it economic? The rise of factory farming of cows brings with it destruction of the environment and suffering of animals and people. There are two ways to react to this dilemma. The vegan way is to boycott all animal products including milk and all milk products. The "organic farming" way is to specifically support traditional, sustainable agriculture. I personally think that both ways are good and feasible for today's consumer since both vegan and organic products are available on the market. The question of which way to live brings up another question, namely: is it a good thing in general for people to consume animal milk and products made thereof? I find it interesting to shed light on different aspects of this question: the evolutionary, the biological, the medical, and the economic. Some adult humans are intolerant to lactose (a kind of sugar which naturally occurs in milk) and therefore can't consume any milk products (unless lactose has been removed in a technical process). This intolerance brings our attention to the fact that some ten thousands of years ago, the entire human race was lactose-intolerant during the adult life. This actually makes sense: mother's milk is a food for babies and infants. As soon as children can consume other food, they don't need to be able to digest milk any more. If we take a broader perspective, humans are just mammals and the function of milk, namely feeding babies, is not different in humans as it is for cats and dogs, or pigs and cows, or bats and kangaroos. From this viewpoint it makes sense to say that nature has made milk for babies and adults have no business drinking it. In other words, the vegan lifestyle (as it relates to milk) is quite natural! On the other hand, we can say that the relationship between human farmers and their dairy animals (cows, sheep, and goats) is also a product of evolution, since both humans and animals have adapted over a course of thousands of years: the animals produce more milk than they need to feed their small, while humans have adapted to be able to digest milk even as adults. Over time this co-evolution of humans and dairy animals has slowly turned into controlled breeding of animals, which we could see as a form of artificial evolution, but its historical beginnings still seem to have been a quite "natural" process. After all, co-evolution and symbiosis of different species occurs in other places of nature, too. In one case, the term "dairy farming" is even used by zoologists to describe how ants live with a certain kind of lice. On the other hand, animal products including dairy are the only "natural" dietary source of vitamin B12 for humans and they also contain some other vitamins in useful doses. So, if you want to optimize your own diet for health and longevity, it is possible to simply take factory-produced B12. If you still want to be somewhat traditional, then some animal products are required. The economic side of nutrition asks how can we feed a growing population of humans on a single planet of constant size? The argument brought forward by vegans is that contemporary factor farming uses a lot of high-value plant foods (such as soy beans, corn, and other grains) to quickly fatten animals at reduced cost for the farmer. Given this type of production, a lot of food that would be perfectly suited for human consumption is used up to produce much less of another food. For example, from the wheat needed to produce one kilogram of beef, we could produce many kilograms of Seitan and even do this with less adverse side-effects for the environment. Similarly, one liter of cow milk from soy-fed cows, uses soy and water from which we could make several liters of soy milk (healthier and more environment-friendly). For those reasons I think that even though factory-farming evolved under economic pressures of efficiency, its products are not at all resource efficient compared to plant-based alternatives. Now, if we look at traditional meat and dairy production, the picture looks very different: grass is not a very tasty food for humans, yet cows love it. Cows grazing outside all day are tending the meadows better than any lawn mower could while at the same time fertilizing it with their dung. Consuming milk and dairy products from those cows, therefore seems a very sustainable form of nutrition. The only thing we need to ask ourselves is if the large spaces and prairies used for grazing should better be used to produce crops with higher yields. In pre-industrial times, letting cows graze was efficient because it didn't take much work compared to planting, tending, and harvesting other crops. (Additionally, oxen were used for ploughing and pulling carriages even up to my grandfather's day!). But in our industrial times, machines do the hard work and it might be that agricultural space is becoming the limiting factor. So maybe, eating grass-fed meat will become obsolete except for nostalgic reasons? Or maybe, grazing will be restricted to places where more intensive crops are not feasible, such as mountains where only mountain goats can go? I think that everybody has to find their own way of living and this short article only serves to weed out some contradictions that people might have in the rationalization for their own life style. My own way of living, at this point of my live is a mix of vegan and organic. I hardly eat any meat at all (except for very little quantities from small animals raised by my family). I avoid dairy ingredients in products where I think they are unnecessary (especially chocolate, cake, and pastries). My milk consumption is totally plant-based (mostly soy milk, some almond milk and others, as well as coconut milk to replace cream in cooking). For cheese and other dairy products, which I do occasionally consume, I am very conscious to buy products based on organic and animal-friendly farming. Preferably from creameries that I have personally visited to have a real sense of what their ethical guidelines are. 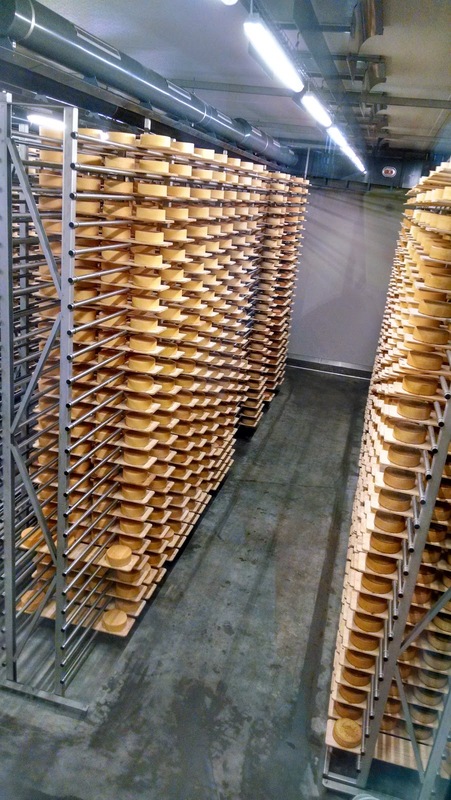 Yesterday, for example, I did my first visit to a regional organic creamery and wrote about it on my blog (in German). But there are also pictures!